Welcome to Monitor: thanks for subscribing. By popular request the Excel Corner is back (thanks those who wrote). If you have any questions on using Excel in engineering or scientific applications, please e-mail [email protected] or fill in the form at https://www.windmill.co.uk/excel/excel-tips.html. We'll do our best to answer your question. Any questions, comments or data acquisition stories, get in touch via email, Twitter or Google+. One of the main environmental factors limiting productivity of wheat crops is nitrogen availability. Cereals need large amounts of nitrogen to increase maximum yield. This has meant that fertiliser application has increased from 1.3 million tonnes in 1930 to 90 million tonnes in 2004. It gets worse: researchers say that by 2050 fertiliser application will reach 240 million tonnes. 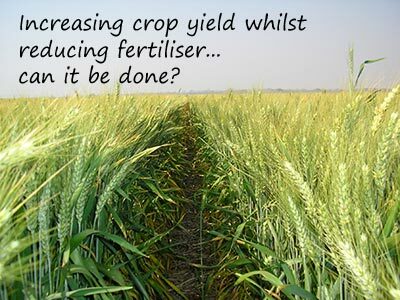 This could be disastrous as excess nitrogen application can contaminate ground and surface water. Spanish researchers - Aranjeulo, Cabera-Bosquet, Araus and Nogues - are investigating the processes conditioning nitrogen use efficiency in the hope of increasing crop productivity. They grew plants in two controlled environment chambers. The air of each module was sampled every 5 minutes, carbon dioxide concentration was analysed and air probes were placed in the centre of each module. They used Windmill Test Sequence software to record the data collected via a Microlink 751 data acquisition unit. Test Sequence automates measurement and control tasks by running a text file of commands. The software understands a total of 47 commands, all specifically for data acquisition and control. Questions on Using Windmill: How to Log Four Streams of Data at Different Rates? I have a requirement to log data automatically from a dial test indicator gauge. I would require the ability to log 4 streams of data at varying intervals, is this something that you would able to assist with? Yes, this is easy to do. 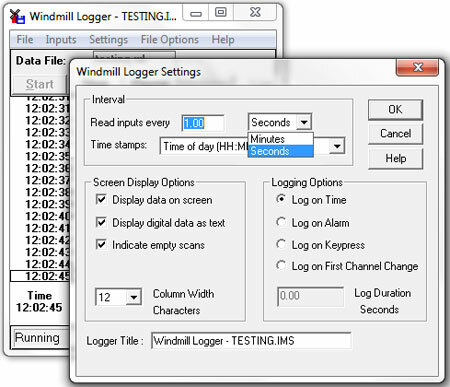 Simply open four instances of our Windmill Logger program, connect one of the streams of data to each, and choose an appropriate logging interval. To set the logging interval, select Logger's Settings menu. You can enter a logging interval down to as little as 0.2 seconds, which would give 5 readings a second. When referencing another cell in Excel, by default Excel will use a relative reference. It has a shortcut though, to quickly change this to an absolute reference. Position your cursor in the function box and press the F4 key. This will step through the different combinations of absolute and relative references: A1, $A$1, A$1, $A1. What are the differences between absolute and relative references? Relative references change when a formula or cell reference is copied to another cell. Absolute references, on the other hand, remain constant, no matter where they are copied. A relative reference depends on the position of the cell being referenced and the cell doing the referencing. For example, If cell B2 referenced cell A1, Excel actually sees the A1 reference as being "one up and one left from B2". If you copy the contents of B2 to cell D4, D4 will reference C7, which is one up and one left from D4. If, instead, you want D4 to reference cell A1, you need an absolute reference. To make a reference absolute you add a dollar sign before it. You can have a combination of absolute and relative references. So the column number might be an absolute reference and the row letter a relative reference, or vice versa. 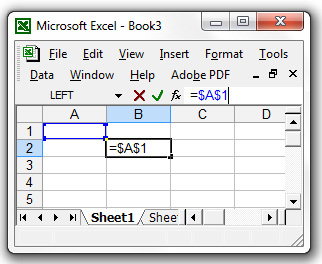 Read more Excel tips at https://www.windmill.co.uk/excel/excel-tips.html. Researchers have developed an automated imaging technique for measuring and analysing the root systems of mature plants. The US Navy have announced a breakthrough for swarming technology during a demonstration with small unmanned boats. By installing sensors and software on existing Navy manned patrol craft, they converted them to unmanned surface vehicles. A fleet of seven aquatic robots has set sail to collect scientific data about ocean processes and marine life. They are carrying a range of instruments. As well as measuring the temperature of the water and the weather conditions at the ocean surface, they can detect the density of plankton in the water and listen for clicks and whistles of dolphins and porpoises. The project has been described as the most ambitious of its kind in Europe.